The Plantronics CS540 battery (part # 86180-01) will initially provide 6-7 hours of continuous talk time. From normal usage, the battery charge time will diminish after years of use. It’s a good idea to replace your battery every year or two or when you notice a significant decrease in talk time. Replacing the battery will maximize your talk time with your CS540 and only takes a few minutes. 1) Slide the battery cover down and away from the speaker. This will remove the battery cover. 2) With your thumb and index finger, pull the battery out from the plastic tabs located on each side of the battery. 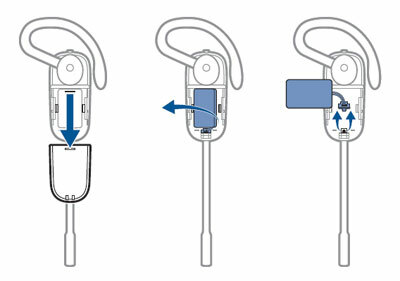 3) Now grasp the white battery connector and pull away from the CS540 headset. 4) Next reverse the previous steps to install your replacement battery. When finished with installation, place your CS540 headset back into the docking cradle to charge. After a few hours your CS540 headset will be fully charged and ready for use.